What an adventurous day. The baby parrots took a small excursion….. planned of course. So far both Wrigley and Beni have had the chance to spend time in each room of my house and also the back yard. They now appear relaxed and comfortable in these environments. This means it was time for us to push the envelope and try a completely new environment. I had done quite a bit of training to get both birds ready for spending more than just a few minutes in a crate for travel. And it paid off. Both birds entered their crates without hesitation. I had already worked on walking them around the house in the crates, and also placing the crates in the car and taking a short drive around the block. Today we took it a bit further and drove to my friend’s house. I packed a familiar perch, lots of treats and a few toys. My friend had recently hurt her ankle and was stuck in her room with her foot propped up on a pillow. Time for some feathered entertainment! I placed the crated parrots on the bed. I set up the portable perch. Now it was time to open the crate doors. One of the things that never ceases to amaze me is how what you think will be so predictable often ends up being exactly the opposite. I was so sure Wrigley the double yellow headed Amazon would be calm as a cucumber and Beni the blue throated macaw would be wide eyed about the new environment. Instead Beni could have cared less. He was just thrilled to be hanging out with people and sucking up tons of attention. He flew with confidence to the perch, to my hand and to the top of the crate. To him it was just another room. Wrigley on the other hand had to take a moment to observe his new environment. He then launched into a few loops around the room before finally landing on his familiar perch. But once that moment passed he was all about exploring, flying to my friend for treats and playing with toys. That was actually my favorite part. The fact that both parrots were comfortable enough in just a few minutes to play with toys was a great sign. 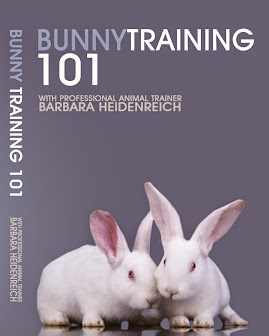 It also meant all that time spent practicing behaviors in new environments was working. Beni and Wrigley are learning to generalize their behaviors. This is an important goal for these future ambassadors for their species. Although they did really well in the new environment we did have one small set back. The crate training suffered a small breakdown. Beni was not so eager to enter the crate for the return trip home. This means the short drive was too big of an approximation for him. Training Beni to crate has been a challenge from the start. I think this is because his first experience in the crate was a 4 hour drive from the breeder’s place to mine. This was more than he was ready for at the time. This has meant a lot of work on this behavior, and no doubt we will spend another session just practicing some repetitions of going in and out of the crate for our next sessions, and building our approximations from there. Even though there was a slight glitch, the good news is we can get back on track. Thankfully, even less than perfect situations can be turned around with a little positive reinforcement. 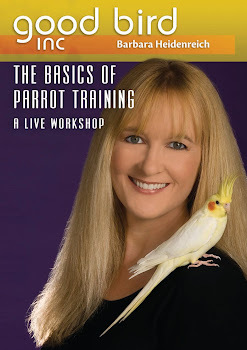 If you are a parrot training fan, you have probably already trained your bird to do a few cute things like maybe wave or turn around on cue. 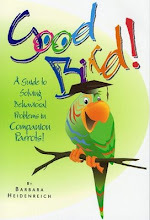 Have you ever tried to ask your parrot to present those behaviors in a new environment? Such as a bird club meeting or at a friend’s house or maybe the veterinary hospital. For some parrots this can be very challenging. Suddenly your outgoing social butterfly freezes up and seems to have forgotten all the things you have taught him to do. In truth he probably hasn’t forgotten, he is just not yet learned to present behaviors in other environments. 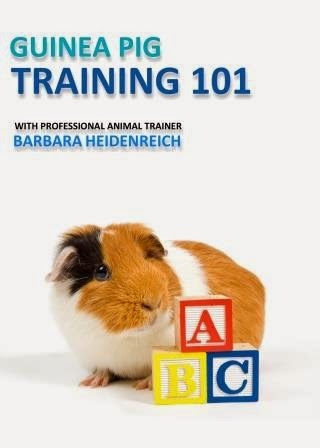 The process of teaching an animal to present a behavior under many different conditions is called generalization. 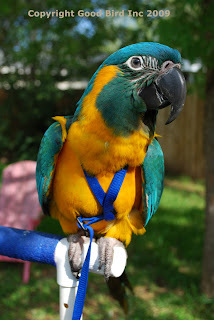 Beni, the blue throated macaw has done so well with harness training it was time to let him experience some new environments while wearing his spiffy blue harness. First we visited different rooms in my house. The bathroom was particularly fun. He got quite excited by his reflection in the mirror. 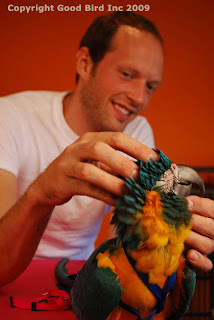 I think he even tried to say “hello” in macaw language. Finally today he started to seem a bit more comfy. I thought now would be a good time to try a favorite strategy of mine. One great way to help a bird move onto the next steps toward generalization is to cue a super simple behavior over and over a few times. 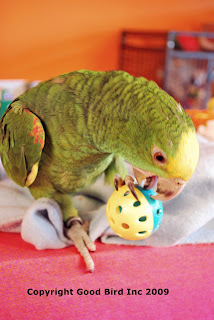 This gives the bird something to focus on that he knows earns some positive reinforcers. What Beni does best is fly to me. I grabbed a familiar perch and placed it in the yard. 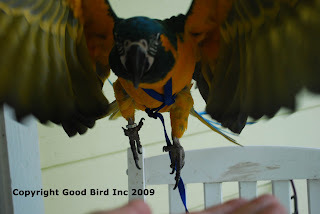 With the leash safely wrapped around my wrist, Beni recalled like a champ. Next thing you know his body language looked much more relaxed and he began to show an interest in exploring this new world with confidence. For Beni, recall is an easy behavior. 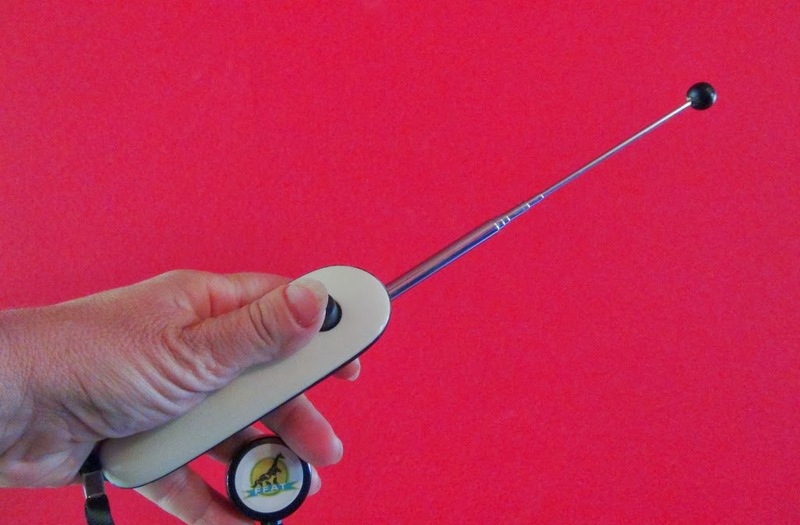 For your parrot it might be something like saying “hello” or lifting his wings or foot when cued. 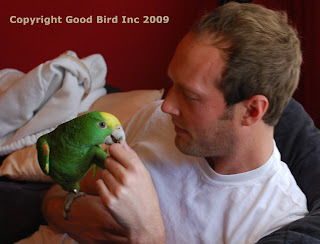 Any behavior your parrot offers readily is ideal for this strategy. Your bird may need some time to desensitize to the environment first before he will present behavior, just like Beni did. But after just a few sessions of looking around, Beni was ready. Once Beni has a few more days of relaxed body language in the back yard, it will be onto another new location and a repeat of the process. Eventually Beni will learn that presenting behaviors in any environment is easy and earns you favorite things like head scratches and treats.